Dante is one of the returning veteran characters from Marvel vs Capcom 3: Fate of Two Worlds and Ultimate Marvel vs Capcom 3. Though besides his appearance in the previous iteration of the game, most know him from his own game series “Devil May Cry“. Many wanted him within the game and displayed hype when he was shown battling Deadpool in the extended E3 trailer for MvC3. Even more hype was given when he was shown to have more moves than ANYONE else in the entire game, meaning that his diversity was going to be insane. People were nearly bursting at the seems as early combo videos from players like Isadelica showed off his potential, but unfortunately this did not keep people using Dante deep into the game’s life. Despite Dante having answers for everything because of his toolset, as well as one of the most useful assists in Ultimate Marvel vs Capcom 3; many decided to use his twin brother, Vergil, in lieu of him because he was easier to use. 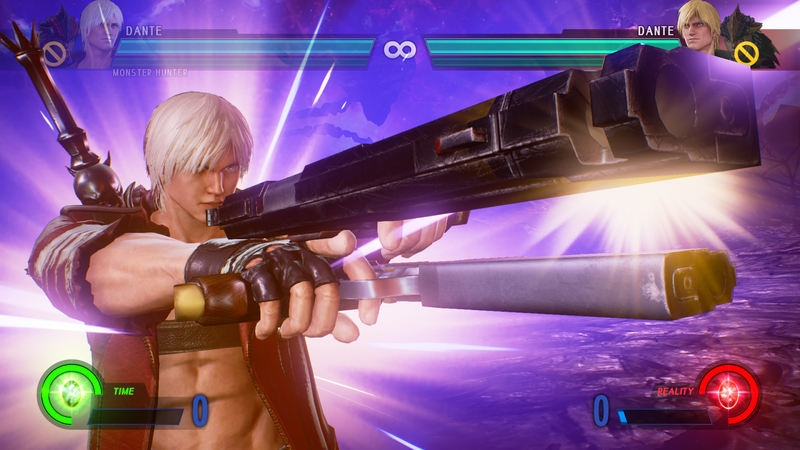 Vergil could cancel his stinger without first having to “bold cancel”, his “sword loop” is vastly easier to perform than Dante’s “clay pigeon” loop, and he was an absolute monster in X-Factor level 3 who could potentially destroy an entire team by himself while Dante used most of his X-Factor time to kill a single character because of his moves’ length. However, this has changed in Marvel vs Capcom: Infinite. 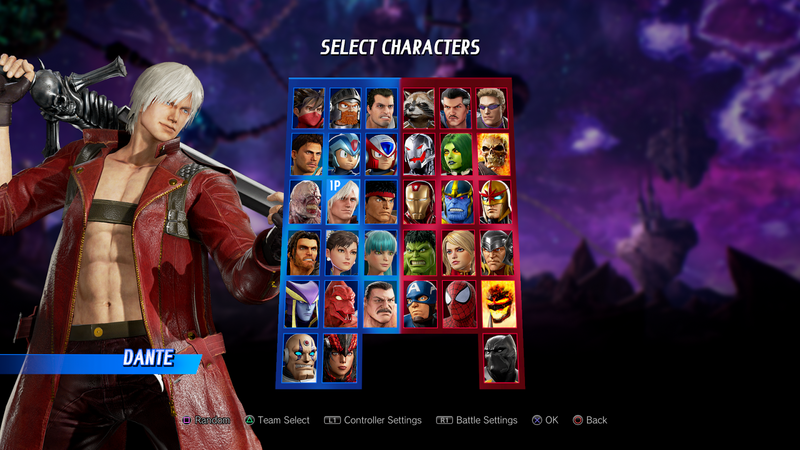 When you get on Marvel vs Capcom: Infinite, whether it is Ranked or Casual matches, it feels like nearly every team you will run into has Dante on it; a stark comparison to when I played Marvel vs Capcom 3. While I had always planned to use him, I wondered why many others were now flocking to him… but it did not take long to figure out why all those who did not give him a second glance in the previous game decided it was the time to migrate. This is because they made the character far easier to use by removing having to bold cancel in order to get decent combos, making hammer have nearly no recovery, making his teleport fairly safe (where at first it was very punishable), tempest into inferno is barely punishable, etc. etc. To be honest, I could continue to go on, but I am sure that you get my point by now. Marvel vs Capcom as a series is known for its cheap stuff, but this is beyond that. You have people who literally can barely play with any other character, but can easily get by using nearly unpunishable moves, the MvCi active tag system, and a fullscreen super with impressive start-up and lockdown properties. In fact, I noticed that when I found a counter for this when Monster Hunter was released as a downloadable character (since her jump heavy punch has armor, it deters people who love to do double jump > rainstorm), it completely shut down Dante players I fought to the point they had no idea what to do next; the whole ordeal was maddening. As someone who’s favorite series is Devil May Cry, favorite game of all-time is Devil May Cry 3: Dante’s Awakening, and who’s favorite character in any game happens to be Dante… you can imagine how disheartening seeing this is. Not only that, but I am someone who is generally annoyed when lots of people happen to be using my character, and only doing so because it is braindead effective. CAPCOM has officially listed the nerfs that will be coming to Dante when the game is patched on December 5th (same day Black Widow, Winter Soldier, and Venom are released as DLC), removing a lot of the ridiculous stuff that he had that made him annoying to fight against. I have listed the changes below for you. Devil Trigger: Fixed a bug that caused health recovery during grab sequence and damage animation. I was hoping for a nerf like this to be perfectly honest, it removes a lot of things that people were using as crutches; double Rainstorms anytime he’s in the air, Jet Stream being nigh punishable due to active tag, Hammer having absolutely no recovery time, etc. These things are exactly why people have been on Dante in unbelievable numbers as it made him so easy to use. 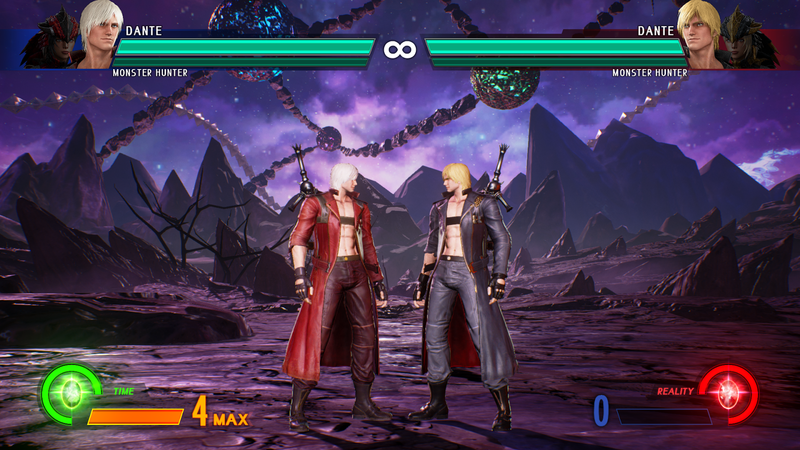 I know most people are saying that “Dante is Dead” because of all these potential changes, it is true that we could find out that CAPCOM committed overkill, but I would rather they nerfed him too much than not enough to make a difference. Also these changes could have already been in place before the game was out; my friend actually fought Combofiend (the ex CAPCOM employee who helped to work on the fighting aspect of Marvel vs Capcom: Infinite) and he was using Dante and abusing the same things that everyone is tired of. While this could be typical of any employee, he is a fighting games player previously, so I am sure he knew that these things needed fixing but wanted a character that was “easy to use” for newer players to have a crutch to get more people talking about the game. 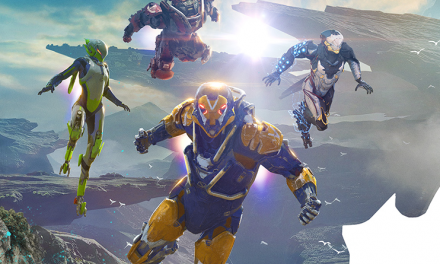 Considering that Marvel vs Capcom: Infinite was free to play this Black Friday weekend and discounted before the patch in only a week…I am sure it was done purposely to get more players on board by giving them a running chance with Dante, non-scaling auto combos, and “beginner’s league” for ranked. Overall, we are going to see how drastically these universal mechanic and personal changes affect Dante as a viable character at the highest competitive level after December 5th; ranbat, tournament, and deep analysis by the Fighting Game Community will let us know soon enough if this was enough to dethrone the undisputed king of Mahvel at the moment. One thing is for sure however, those who enjoy Dante as a character outside of fighting games will stick with him an unabashedly smile as we make him work despite whatever state he falls into. Christmas is coming early for a lot of players, I believe that consensus is mutual no matter which side of the fence you are currently sitting on.